formal diagnosis | Tania A. Marshall, M.Sc. I have received an overwhelming amount of FAQ’s in relation to female Asperger Syndrome. Over time, I will answer some of the most frequently asked, in addition to some unique questions or issues. Q: What is involved in a diagnostic assessment for an adult female? 3. A review of a 3-4 page autobiographical description of the person, their experiences from their earliest memories until around age 21, or so. This is usually sent to me via e-mail before our first appointment. 4. A family member, partner or long-term friend may be interviewed to ascertain another perspective/thoughts of the individual. 5. The results of the assessment are then discussed and a diagnosis confirmed or ruled out. If the diagnosis is confirmed, time is also spend on “now what?”, in terms of knowledge of Aspergers in females, self-understanding, furthur education about Aspergers in females, career, the type of support the person may need, disclosure, academic accommodations, sensory processing issues and the development of a sensory management kit, treatment and/or intervention for anxiety/depression or other conditions and future/furthur recommendations. 6. For certain individuals, secondary so-existing conditions are also addressed (for example, personality disorder, gender identity disorder, gender issues, eating disorder, to name a few). Q: What are the benefits to diagnosis as a female adult? To learn about how mind-reading and theory of mind training can improve their relationships with others, whether that be in the work place, with a partner, family members of friendships. Q: How do I go about getting a diagnosis? A: I recommend searching for a qualified and experienced professional who is trained in the area of female Autism and Asperger Syndrome and understands how females with Aspergers present, as compared to the male profile. I currently provide these services via Skype to adults from a variety of countries (USA, Canada, UK, Australia), in most cases for those who have self-diagnosed and are seeking a formal diagnosis from a specialist in the area. Q: What happens after a diagnosis? A diagnosis is merely the starting point. What follows is an individual plan that usually includes learning more about female Aspergers, finding out what the individuals talents, gifts, strengths are (if they don’t already know), addressing any weaknesses or challenges, working on career options and the best type of work for a female with Aspergers, stress management, relationship or friendship difficulties, burning bridges, and so on. 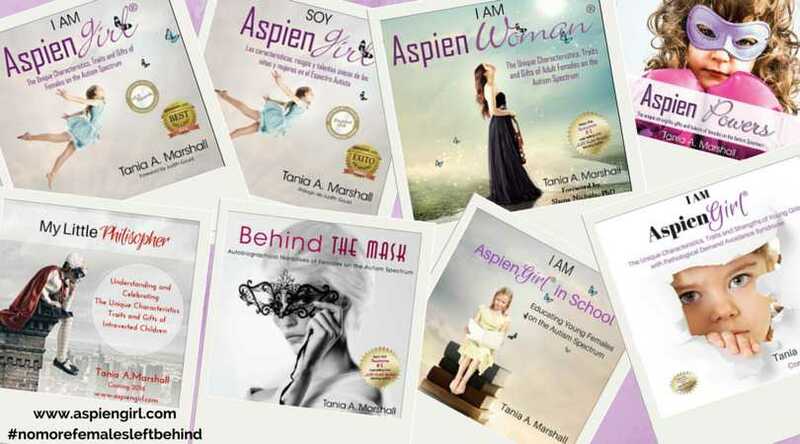 Tania Marshall is a psychologist, researcher and writer who is writing articles and books on Asperger Syndrome in girls and women. She has worked within this area for over 20 years and has supported hundreds of individuals with Asperger Syndrome/Autism. She is currently completing a book series on female Asperger Syndrome/Autism. She has attended several professional trainings and observations by Professor Tony Attwood and other experts, in addition to attending three full-day clinic observation days at his home clinic. She closely follows Professor Attwood’s assessment, diagnostic and intervention procedures. Tania provides specialized services to individuals and families affected by Autism and Asperger Syndrome. Tania also provides diagnostic assessments, intervention and support in her private practice and/or via Skype, Facetime, or other means. Tania can be reached at admin@centreforautism.com.au for appointments and/or services, in person or via Skype. Due to the high volume of e-mails she receives, she may not be able to reply to every e-mail. All e-mails and inquiries related to diagnostic assessment and/or intervention services will be replied to. Tania currently divides her time between private practice, writing and research. Tania Marshall©. 2013. Professional Q and A Series. All rights reserved. Duplication in whole or part is explicitly forbidden. Thank you.